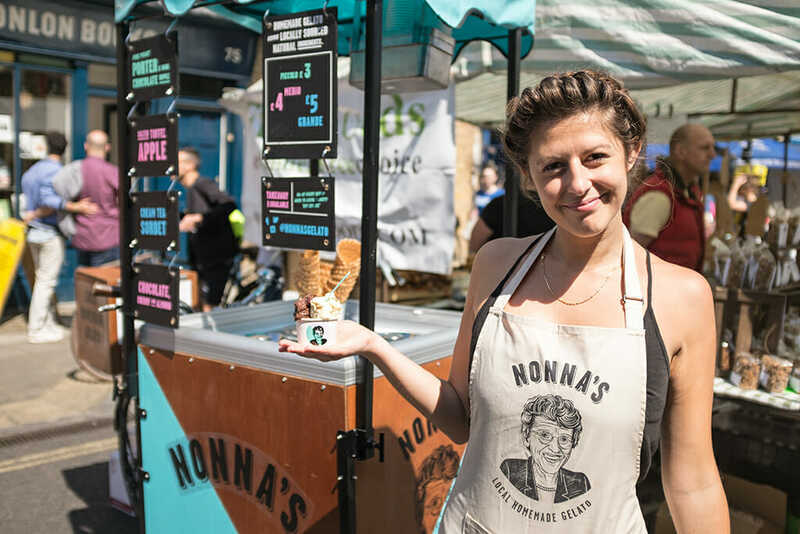 The food industry is famously man-heavy, but there’s an increasing number of women taking their edible expertise to the streets. 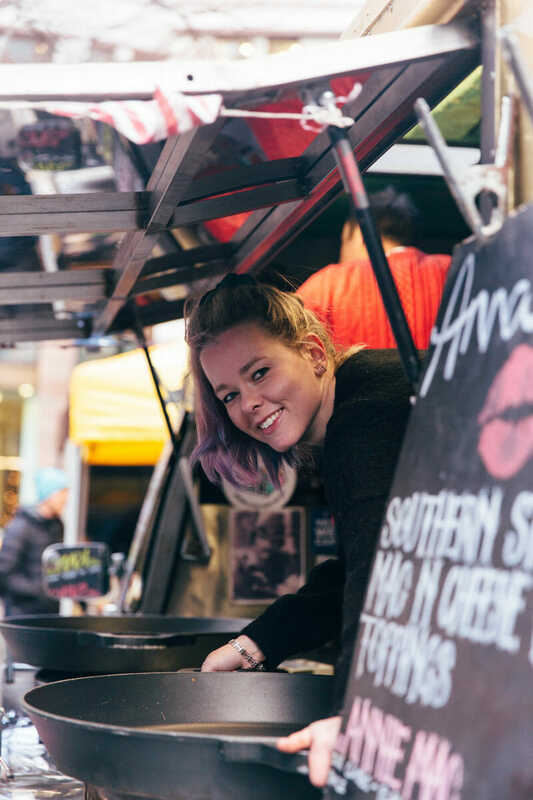 Ashleigh Arnott asked six female street food traders about what it’s actually like to work in street food in London. Before street food, I was working for a women’s organization and although I was a committed feminist, needed a change of direction. I quit my job and worked for a few different people – at supper clubs, festivals etc – and then decided to have a go at doing something myself. I don’t think street food was considered a good ‘career’ to change to back then and I still get asked by some people if I do this full time… I tend to reply that it’s more than full time! We serve straight up comfort food! Seeing people enjoy our food and come back, again and again, is the best bit of my job. We get little kids sending us letters and expat Americans emailing telling us we are their favourite mac ‘n’ cheese fix. Since publishing our recipe book it’s also great to see how many people make our recipes at home. My advice to budding businesses is start smart: don’t put a lot of investment into something you know nothing about, research and understand your market/product/service before you throw in all your cash by testing it first. It’s essential to be flexible and prepared to tinker with your idea if you find aspects of it don’t work. And go with your instincts, they are the best guide you have! Cheffing and professional kitchens have always had quite an intimidating reputation but I think street food, especially, has given women an opportunity to work differently, which has resulted in some really interesting and creative projects. The biggest challenge is finding a balance between work and my personal life. When you care deeply about your work you throw yourself into what you’re doing, but it’s really important and very difficult not to let it consume you. We make homemade gelato and sorbet. I’ve always had a love for it and eaten ice cream in abundance. Being half Italian I wanted to create proper Italian gelato and my Nonna has always made everything from scratch so it was inspired by her. London’s street food community is unbelievably welcoming and friendly, it really is like an extended family. Everyone is always willing to help each other and it’s mainly great fun! The food industry is a male-dominated industry but that is definitely changing and the women that are well known are always represented as strong, incredibly talented and independent women, doing what they do best! I didn’t particularly find it harder [as a woman] to start my business, it took a lot of hard work – and literally blood, sweat, and tears – but it was worth every second. I used to work with Pippa, the founder of Pip & Nut, at the Science Museum [Sophia worked in the Science Museum’s picture library and archive] and I completely admire the amount of work she’s put in to build her brand up to where it is today, it’s so inspiring! I starting working in street food in 2011 when MEATliquor opened their first site & I took over the MEATwagon. Before that, I worked as a fashion stylist and now I’m a cheesemonger. I serve cheese toasties. Note toastie, not a ‘grilled cheese’ as I’m a slave to my humble Breville. I’ve worked in cheese for years and it’s my main passion so seemed like the perfect choice. In the winter I do raclette and fondues too because you need something to dip the toastie into, right? Having a stall in such a local and historic market as Holcombe Market (Tottenham) means you have great regulars and get to know people really well which is a major pro. Spending too much time chit chatting would be the con! The community is brill. There are loads of great groups online to swap info, staff, equipment & opportunities. My biggest challenge so far has been lifting a twin tank 16L fryer. I really admire Ruth Spivey from Wine Car Boot. Wine Car Boot is essentially a street food fest but with wine instead, what’s not to admire? I also think her previous project Street Vin was pioneering. Street food was something I got into straight out of uni so it’s the only thing I’ve ever known! We have two companies, one does fried/grilled chicken burgers and the other does crispy squid. Both are modern dishes with an Asian twist. One of the things I love most about the street food industry is that it’s so inclusive of every type of customer. The close contact means that we know our customers inside out and having that interaction gives such a personal touch which can often be lost in other areas of the food industry. The best support we’ve found has been from other street food traders, as well as KERB and Street Feast. Everyone in this industry always wants to help each other which is lovely. I think Instagram’s a great tool for a business, especially food as it’s so visual, and is a great way to showcase your brand identity. However, we used to find Twitter a lot more interactive than Instagram has been. My advice to new businesses is to be confident about what you want to do. Don’t be shy and don’t worry about making mistakes. I also think it’s vital that the first year or so it’s you that is constantly on the stall/kitchen. You really need to know your customer and what your selling like the back of your hand to make sure that you’re successful. You’re not just cooking food, you have to know about everything from gas bottles to spreadsheets. I’d recommend getting your numbers right at the beginning so you’re not chasing your tail with margins. 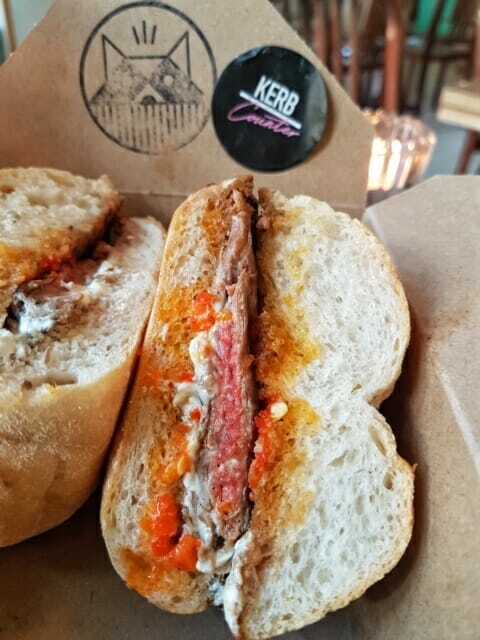 We serve Portuguese Pregos (steak sandwiches). 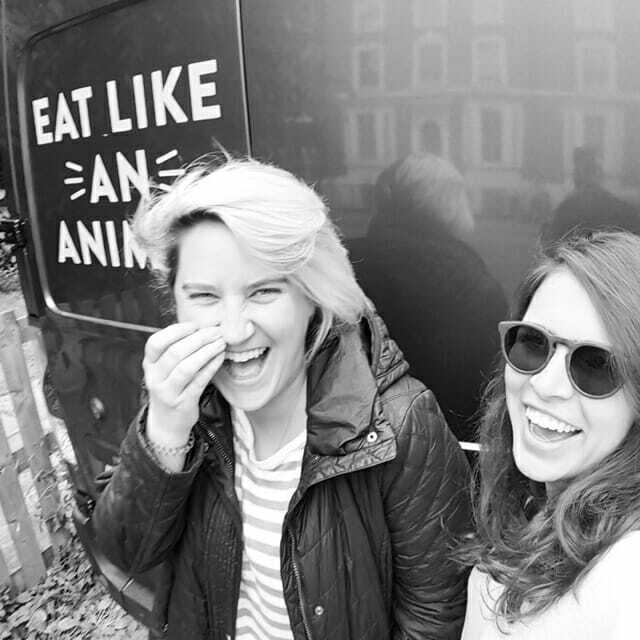 We are both massive prego lovers, having grown up in Portugal and South Africa, and we wanted to bring a little bit of home to the London streets. It is such an energised and dynamic community. Like both of us, so many of the other traders come from different countries, careers and with that bring a rich and varied approach to food. Our customers are often the kind that doesn’t care if there’s mayo and meat juice dripping down their face! Seeing people enjoying your food has to be one of the best highs out there. So often when you are a chef in a restaurant, there is a separation between you and your customers – we get to see it all. However, with that comes the flip side. There is no buffer and you need to be able to deal with issues as swiftly as possible because the steaks are busy cooking and the queue is full. Being a part of a market or other organisations is essential. KERB have been instrumental in our growth and have given us a community of other traders who are now our friends and greatest source of information and advice. 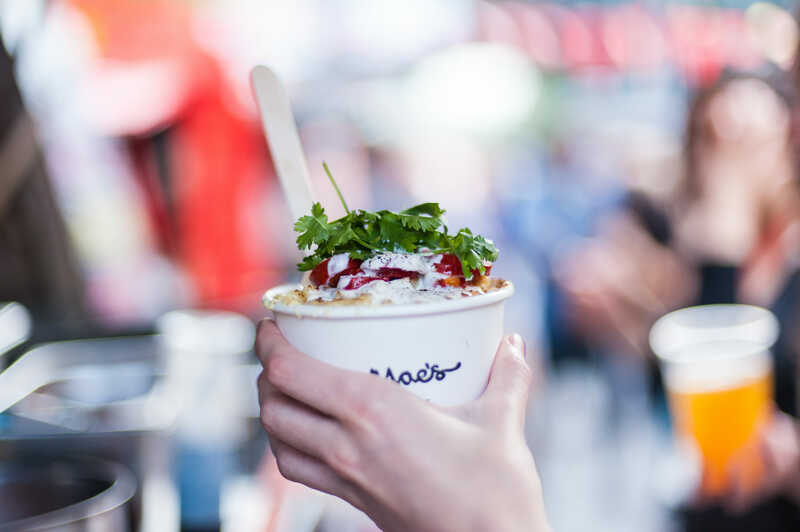 NCASS knows everything about food businesses in the UK, we found their help invaluable and they are still our first port of call for information. It is tough but it is such fun and a wonderful place to learn about yourself as a person and a businesswoman. Our best advice would be DO NOT GIVE UP and go into it with your eyes open. Working in street food could not be more different to my ‘sensible’ weekday job in financial services. On a Sunday I’m trading at a street food market, 24 hours later I’m sitting at a desk in the City. For me, the biggest challenge is running the business while working. I work 14 hours a day, 7 days a week. A night off is unusual, a day off is impossible. 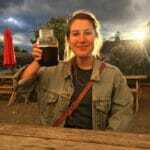 But it’s just what I have to do while I build the business because I’m still reliant on the income from my weekday job. Obviously, it’s hard, but I see it as an investment in my future. Plus, I love running my business so a lot of the time it doesn’t feel like work anyway. It’s also pretty hard doing it on my own, as most people seem to have business partners. I sell sweet pie by the slice. One of the good things about my product is that it appeals to most people. I’d say the majority of my customers are Instagrammers but I get people of all ages and backgrounds coming to the stall. Social media, and Instagram, in particular, is an absolutely vital tool for my business. I also love the community aspect of it and the fact I’m creating a little pie fan club! It can feel like a bit of a cliquey boys’ club at times but there are plenty of guys who really make the effort to make people feel welcome at the markets, regardless of gender. In terms of advice to other women, I’d say just go for it! It’s easy to spend ages trying to plan and create the perfect business, but once you start trading you’ll get so much feedback from customers that the brand and product will change/develop anyway. Learn to roll with the punches, be tenacious, and celebrate the small victories. A business that inspired me right from the start is Single Variety Co. Nicola’s products have won awards (for good reason) and she has achieved so much in such a short time. There aren’t many female-led businesses but the ones that are out there are incredible.